London is an exciting, busy, vibrant city but sometimes the noise and the crowds can get a bit too much. That’s when you need to make your way to one of the lovely green spaces in the Capital, where you could almost be in the middle of the countryside. We’ve rounded up five of the best options for a bit of peace and quiet in the midst of this bustling city. 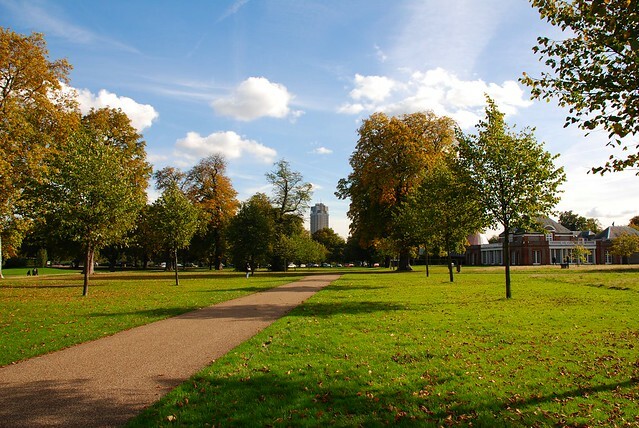 Hyde Park is a great place to start; it’s easily accessible by Tube and there’s always something to see. It’s a popular venue for music and small festivals, so probably best avoided when there’s a big event on. However, most of the year it’s a haven of peace and quiet, home to London’s oldest boating lake, The Serpentine, with its ducks, swans and bird-life and is one to visit just for its history. Head off in the direction of Marble Arch Tube station and you can pay a visit to the old Speakers’ Corner (established in 1872) – it’s open to everyone to rant about anything they want and you might catch some free entertainment. Perfect for: Sunny afternoons, lazing by the Serpentine and splashing in The Joy of Life Fountain, Princess Diana’s memorial. There’s always something going on in Regent’s Park – one of London’s most popular parks. The proximity to London Zoo means that you can take in both attractions in one fell swoop if you so desire, although the downside is that when the wind is in the right direction you can really tell you’re next to the zoo. However, there is culture too – the open air theatre, bandstands and different festivals over the summer (food and music related) provide a distraction, and for lovers of horticulture, the fabulous rose garden is a delight. For the kids, there are playgrounds and several places to stop for an ice cream, plus a timber tree house area for older children next to the boating lake. Perfect for: A family day out with lots to see and do – and peace and quiet for parents! A peaceful retreat, loved by royalty for centuries, St James’ Park is ideal for photographers and nature lovers, with a central lake that boasts several types of wildfowl, including pelicans. Unusual for this part of the world, the original birds were donated to the park in 17th century by the then Russian ambassador and these days you can see them being fed every afternoon. Other scenic areas include the bridge over the lake from where you can see Buckingham Palace. Perfect for: Scenic views, leisurely strolls and bird watching. If you want to head slightly out of the City in search of lush meadows and woodland, your best bet is to head north to Hampstead Heath. Replacing beautifully manicured lawns with grassy meadows (and there are even plans to graze sheep on the heath in the future), you’ll find woodland, ponds and playing fields stretching for acres, and of course the famous Parliament Hill. Literature lovers will love Hampstead Heath; Keats composed “Ode to a Nightingale” after hearing a nightingale singing on the Heath, as he sat in the Spaniard’s Inn, and CS Lewis got the inspiration for “The Lion, The Witch and The Wardrobe” from walking on Hampstead Heath in the snow. Perfect for: Peace and quiet, or inspiration for your next book! Not as well-known perhaps as our other suggestions, the Chelsea Physic Garden is a beautiful retreat; an old walled garden that is home to the world’s oldest rock garden, which includes historic stones from the Tower of London, and 18th century Icelandic lava. Here’s where you’ll also find Britain’s first garden of ethnobotany – if you don’t know already, ethnobotany is the scientific study of the relationships between people and plants, how we use them, and what we use them for. The garden is open to visitors on Wednesday, Thursday, Friday, Sunday and bank holiday Monday afternoons from April to October, and well worth a visit for some of the unusual plants, the super foods garden and the delicious home-made cakes you can sample in the café. There’s a range of guided tours, walks, talks and interesting workshops on offer too. Perfect for: Botanists and gardeners. Nearest Tube Stop: Sloane Square or Victoria; then walk or take the 170 bus. Who said that London was all about noise, shops and cars? Take a walk around one of the lovely parks and you’ll feel refreshed, renewed, and ready to face the Tube once again. If you fancy getting further out into the countryside, London is the starting point for many tours of Britain, which include areas of natural beauty such as the Peak District and Snowdonia National Park. Written by Alexandra Johnson, a fan of London who loves to picnic on Hamstead Heath with her friends in the summer. London is really a great place to visit! The atmosphere is always very refreshing especially when walking in the Hyde park! Its feels really good! This is really so wonderful and amazing place. I really want to visit this place. As you tell it is the best I think. London has the most wonderful parks. Love it there.